Arugula is a fantastic herb which is darkish green and has peppery flavoured leaves. It is normally found in salads sold either loosely or in bunches. It is also called Eruca savtiva and is an annual plant. 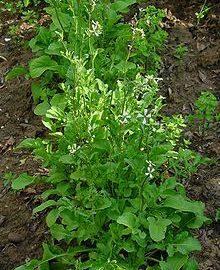 It’s other names are Colewort, Rugula, Rucola, Roquette, or Salad Rocket. It’s spiky dark green leaves look much dandelion leaves. So, can rabbits eat arugula, and if they can how much of it can be eaten. Let’s take a look and find out more by looking closely at its nutritional data. In particular we are interested in its starch, sugar, phosphorus, calcium, and acidic content as they affect rabbits the most. As you can see Arugula has quite a bit of calcium in it but other than that is not bad for rabbits. Not to mention, it has a nice amount of protein and a little fiber to help with nutritional input. With this in mind rabbits can eat arugula, but not too much. Two to three times a week should suffice, but not every day because of the calcium content.